A volunteer recruit at the age of 17 in 1915, he trained at Fontainebleau Artillery School before taking part in the Battle of Aisne with the 61st Artillery Regiment. He was often on the frontline with the infantry to provide the information needed for directing his group’s battery fire, earning him promotion to the rank of second lieutenant at the age of 19. 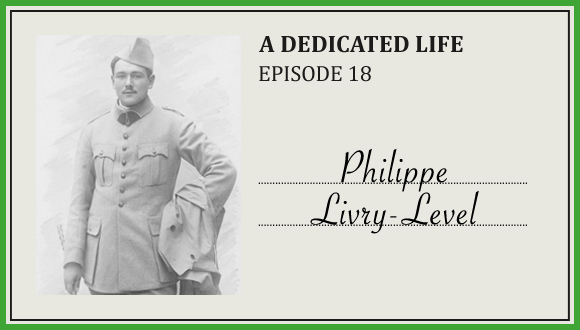 In July 1918, his unit distinguished itself by repelling the last German attacks in Champagne before saving Amiens in August. From then on, the Kaiser’s troops could no longer avoid retreating. When war broke out again in Europe, he asked to re-join his regiment despite his age and his five children. He became part of the Resistance after the armistice, and in April 1941 managed to reach England, where he joined the Royal Air Force. As an air observer, he accomplished many missions against German submarines, then smuggled Resistance fighters between London and occupied France.